Even though I can [tag]type[/tag] fast, I still make lots of [tag]mistakes[/tag] and despite my, seemingly, endless years of higher education, there are still words I [tag]misspell[/tag]. Thankfully, almost all [tag]word[/tag] processors have [tag]spell[/tag] checkers “built in” these days, but the web browsers still do not come with built-in spell checkers. I find this odd since the majority of us now use web browsers as our one super-application; most of us use the web browser more than any other application on our computers. While traversing the web, I have come across three [tag]freeware[/tag] [tag]spell[/tag] [tag]checkers[/tag] that I have put to use daily and can personally vouch for. Since I perform quite a bit of web [tag]programming[/tag], I use multiple browsers to check the layouts of my web design to see if they are consistant across the platforms. Although there is no one program that works with the three main web [tag]browsers[/tag] I use, ([tag]Opera[/tag], [tag]IE[/tag] and [tag]Firefox[/tag]) I do have a different one for each. 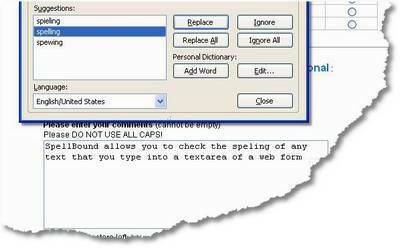 SpellBound is a spell checker for the Firefox browser, that allows you to check the spelling for any text that you have typed into a web form or text area. Just right click in the form or select the text to be checked, and a dialog will mark misspelled words and automatically suggest replacements. ieSpell is an Internet Explorer browser extension that spell checks text input boxes on a webpage. The program installs on the IE toolbar. 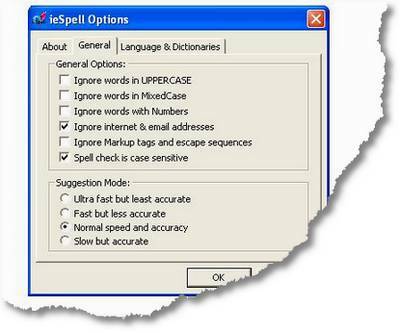 To use it, simply click the ieSpell button on the toolbar and a new spell checking dialog box will appear. [tag]GNU[/tag] Aspell is a Free and [tag]Open Source[/tag] spell checker. 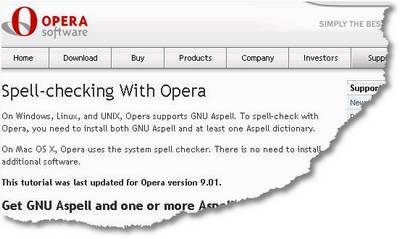 Opera actually recommends it and has a detailed support page for it on their site: http://www.opera.com/support/tutorials/opera/spellcheck/. Aspell works very similar to Spellbound, simply just right click in the form or select the text to be checked, and a dialog will mark misspelled words and automatically suggest replacements.